1. 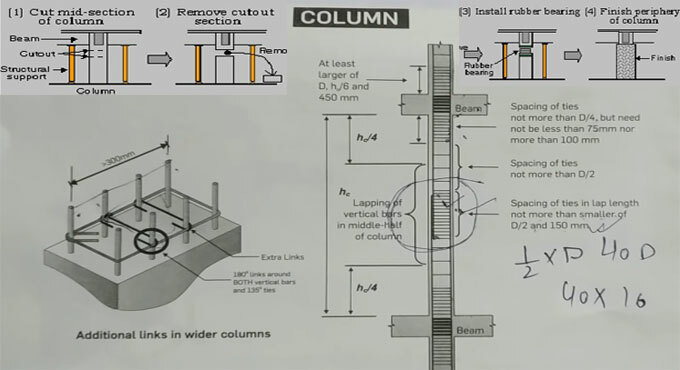 How to create the design of an earthquake resistant column independently. 2. Elementary things of column design. 1. Least width of column for one story or two storied building should be 300 mm. 2. The width of the column remains up to 200 in case unsupported length is under 4m and length of beam among the column is under 5 m.
3. Spacing of the stirrups at other locations should not be in excess of ½ of the smallest dimension of the column. It means ½ x D. If the dimension of the column is 300 x 400 then 300 x ½ = 150 should be the spacing. 4. In column, where the spacing among the corner bar surpasses 300 mm, extra stirrups or hooks should be provided at 180 degree bent. 5. The bar should be lapped only in the center half of the column. Minimum lap length should be 40D i.e. 40 x dia. 6. The spacing among the tiles should be tighter along the length of the lap.